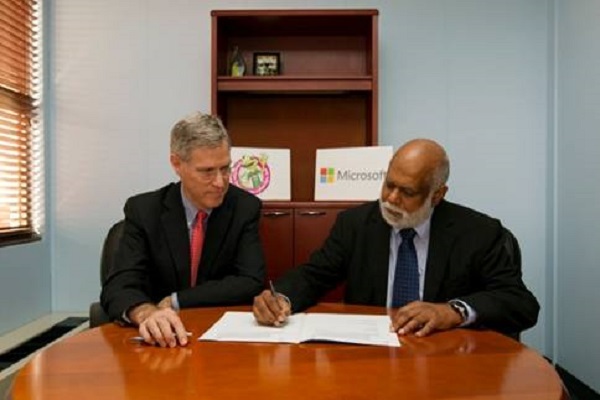 The Minister of Education and Economic Development, Dr. Grant Gibbons last week signed a new agreement with the Microsoft Corporation for the continued use of the company’s online safety material. Microsoft will continue to supply the content material at no cost to the Bermuda Government. The agreement will take effect immediately and continue through a two-year period. Bermuda will continue to have access to certain content, videos and other information related to cyber security and exclusively developed and produced by Microsoft. The materials include content that promote safe technology practices for students, parents, teachers and individuals at home or work. The materials are to be featured on the Department of E-Commerce redesigned cybertips.bm website. The cybertips website also features materials provided by other partners such as the Bermuda Police Service. The agreement was signed by Minister Gibbons and Microsoft Territory Manager, George Gobin. Minister Gibbons said, “We thank Microsoft for the continued use of these materials. Technology is ubiquitous in Bermuda and we are more than ever digital citizens in a very connected world. “We must therefore ensure that our interactions in the technology world are safe and secure. This Microsoft agreement provides us with a library of content and tools that will benefit all sectors of our population, from students to seniors. “We are honoured to extend this agreement with the Department of E-Commerce on behalf of the Government of Bermuda. Security and internet safety is clearly a top priority for Microsoft. We are committed to driving innovation, building trust – and trustworthiness – in computing, so that all people can have the very best experience with our technology and can realize their full potential through the magic of software and internet services.” said George Gobin, Microsoft Territory Manager.